Between 1941 and 1943, Paramount Pictures released a series of animated Technicolor cartoons based upon the comic book character Superman. The first nine cartoons were produced by Fleischer Studios; in 1942, Fleischer Studios was dissolved and reorganized as Famous Studios, which produced the final eight shorts. These cartoons are seen as some of the finest, and certainly the most lavishly budgeted, animated cartoons produced during The Golden Age of American animation. Superman and the Mole Men is a 1951 black and white film starring George Reeves as Superman and Phyllis Coates as Lois Lane. It was produced by Barney Sarecky, directed by Lee Sholem with the original screenplay by Richard Fielding. It was 58 minutes long and served as a trial run for the syndicated TV series. Mild-mannered reporter Clark Kent and Lois Lane are sent to the small town of Silsby for the inauguration of the world's deepest oil well. Unbeknownst to the drillers, however, the drill shaft has penetrated the underground home of the Mole Men, a race of small, furry beings. The Mole Men come up through the shaft at night to explore the surface. Their eyes, however, glow in the dark, presumably an adaptation for an subterranian existence. This scares the townspeople into forming an angry mob, led by the violent Luke Benson, in order to kill the "monsters." Of course, Superman is the only one able to resolve the conflict. Batman vs. Superman is the title to a cancelled American film based on the DC Comics' superheroes Batman and Superman. The film was greenlighted by Warner Bros. in 2002 with Wolfgang Petersen directing from a script by Andrew Kevin Walker and Akiva Goldsman. The film was expected to film in 2003 with a release in 2004. The project collapsed when Petersen left the project to direct the historial epic Troy. As of 2005, Batman Begins producer Chuck Roven believes the two men in tights will meet one day. 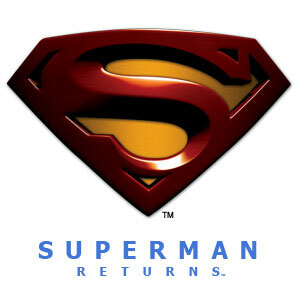 "It all depends on the success of Superman Returns. The current script is superb." Supergirl was a 1984 feature film. It stars Helen Slater in her first motion picture role in the title role of the DC Comics superheroine Supergirl. It was a spin-off from the popular 1978 movie Superman, with Marc McClure reprising his role as Jimmy Olsen. The movie performed poorly at the box office and failed to impress critics or audiences. In fact, Peter O'Toole received a Golden Raspberry Award nomination for Worst Actor for his performance. It does, however, contain some fascinating expansions on the Superman movie mythology, such as taking us into the Phantom Zone itself (in the first two films, it was merely represented by the infamous spinning black pane of glass). The special effects were a distinct improvement. The story uses sorcery (a noted Superman weakness, but less favoured over kryptonite) as a counter attack on Supergirl to great effect. Superman (as it was shown on-screen and in the movie poster--see illustration), also known as Superman: The Movie (as it was called in pre-release advertising), is a superhero movie, released by Warner Bros. in 1978, and based on the popular DC Comics character of the same name. Christopher Reeve starred in the title role and that of Clark Kent, while top-billed Marlon Brando played Superman's father, Jor-El—for a record-setting salary at the time—of $4,700,000 for eight minutes of screen time; other prominent cast members were Gene Hackman as Lex Luthor, Margot Kidder as Lois Lane, Ned Beatty as Otis, Jackie Cooper as Perry White, Glenn Ford as Pa Kent, Valerie Perrine as Eve Teschmacher, Marc McClure as Jimmy Olsen, and Jeff East as the young Clark Kent. It was directed by Richard Donner and executive produced by Ilya Salkind, with music by John Williams. Superman II is a 1980 sequel to the 1978 feature film Superman. Unusual for such a major production, its release in Europe and Australia was in late 1980 but was not distributed in the United States until June 1981. Superman III is a 1983 movie that was the third of four movies based upon the long-running DC Comics superhero produced in the late 1970s-early 1980s. The cast includes: Christopher Reeve as Superman/Clark Kent; Richard Pryor as Gus Gorman; Jackie Cooper as Perry White; Marc McClure as Jimmy Olsen; Annette O'Toole as Lana Lang; Annie Ross as Vera Webster; Pamela Stephenson as Lorelei Ambrosia; Robert Vaughn as Ross Webster; Margot Kidder as Lois Lane. The film was the last Reeve/Superman film produced by Alexander Salkind and Ilya Salkind. It was followed by Supergirl in 1984 and the non-Salkind sequel Superman IV: The Quest for Peace in 1987. Superman IV: The Quest For Peace is a 1987 film, the last of the Superman theatrical movies starring Christopher Reeve as the Man of Steel. In this film Superman battled Lex Luthor (Gene Hackman) and his creation, a super-powered evil clone of Superman called Nuclear Man. Unlike the previous three movies, which were produced by the Salkinds, the fourth movie was produced by Golan-Globus' Cannon Films, in association with Warner Bros.
Superman Returns is a 2006 American superhero film based on the fictional character and superhero Superman. The film is currently being directed by Bryan Singer and the role of Superman/Clark Kent will be portrayed by Brandon Routh. The roles of Lois Lane and Lex Luthor will be played by Kate Bosworth and Kevin Spacey, respectively. The screenplay has been written by Michael Dougherty and Dan Harris. Filming initiated in February 2005 and the movie is expected to be released in the United States on June 30, 2006. The continuity established in Superman: The Movie will serve as its back-story, or as Singer puts it, a 'vague history'. Bryan Singer plans to incorporate unused footage of Marlon Brando's performance as Jor-El from material directed by Richard Donner for Superman: The Movie and the original version of Superman II. In addition, pieces and motifs of John Williams' classic film score for Superman: The Movie will be adapted by composer John Ottman and incorporated into the film's new score. Bryan Singer is also reported to be targetting for a PG rating rather than the PG-13 rating of current superhero-themed movies. Superman Lives was the title of a cancelled American superhero film based on the DC comics character Superman. It was going to be a movie version of the Death and Life of Superman storyline, and was slated for release in the summer of 1998 before being put into development hell and cancelled. Superman Lives had a long and protracted history stretching back to the mid-1990s with Kevin Smith and Tim Burton being signed on to write and direct and Nicolas Cage slated to star as the Man of Steel, Sandra Bullock as Lois Lane, and Jack Nicholson as Lex Luthor, even going as far as appearing in costume for a screentest. Although actual photographs have never been officially released, Superman's traditional costume comprised of; a dark blue bodysuit covering the feet, no boots or belt, a blood red cape and a re-designed S logo. World's Finest is a 2004 fan film made by Sandy Collora. It is in a fashion the sequel to Collora's 2003 fan film Batman: Dead End. Since it is a fan film, it was not, and never will be, allowed to be sold at a profit and was thus distributed for free on the internet. The film is in fact a trailer for a "World's Finest" movie ; however, there is in fact no such movie intended or made. The film features DC Comics characters Batman and Superman, along with several other DC Universe characters, such as Lois Lane, Two-Face, and Lex Luthor. It is intended to demonstrate the possibility of such a movie in the future, and to pay homage to the iconic nature of the characters.